Buddy Westphal has been raising registered Charolais near Polson, Montana, for several decades, producing bulls for commercial cattlemen. “Since we are raising bulls to sell rather than calves for beef, I have not gone through the certification process with the BQA program, yet I feel extremely qualified on this topic. I feel that what I’ve learned through experience and misexperience over the years and with my background at Colorado State University, this makes me adequate in the way we handle all vaccines and medications. But I am glad our industry has this program because it is helping educate newcomers to the cattle business, teaching this information. There are people getting into the business today – from small farmers to purebred breeders – who have no livestock background,” says Westphal. Some are doctors, lawyers and other experts in their own fields who don’t know much about raising cattle. They may want to get “back to the land” and have a few cattle, or follow a dream of ranching, or invest in a seedstock operation. They need some education about proper techniques and locations for administering vaccines/medications to their animals. “I am glad someone is doing this, and that the beef checkoff is funding the program,” he says. “It’s like having a school board. I am glad someone is taking time to do it. There’s always the question about whether they are spending our money well – whether the taxation is getting enough return for the dollars – but I’m glad it is being done. “Since I market 600 to 700 animals per year, I am paying a lot of dollars into a program that I am glad someone else is taking care of. I don’t want to have to be doing it myself,” he says. Noting how many new people coming into the industry, Westphal says the educational BQA material is helpful to teach how to set things up when working cattle, where to vaccinate and how to do it. Knowing the anatomy of the animal, particularly the neck, is important to learn – to understand where the windpipe and esophagus are located, where the spinal column is (under all that tissue), and the safe area of muscle for IM injections. “I had an advantage, early on, going through the meats lab at college, knowing the animal inside out. Then for years we’ve sold our heifers on the NHTC (non-hormone treated) program where they have the EID tag to go through feeding, and we get carcass data back for each heifer. Westphal wants a perfect carcass with every animal he sells, to get premiums when they are worth more. “All of these things help in the beef business, when we have the ability to trace things back and learn from each end of it,” he says. Educating producers about what they are producing and the best methods for vaccinating or treating an animal is an important aspect of the BQA program. “The safety part, the rules about what to do and what not to do, is common sense, but common sense just isn’t common anymore,” he says. Another difference is that in earlier years most injections were intended to be intramuscular – deep into muscle tissue. Even though the big muscles of the hindquarters have the most area for absorbing a large injection, these were not the best places to put foreign material into the animal because these are the best and most expensive cuts of meat. Studies showed there was more involved than residue issues when injections are put into muscles. There might be scarring long after the medication or vaccine was eliminated from the body. So drug manufacturers came up with many products that could be administered subcutaneously. Guidelines evolved to educate stockmen about putting all injections (both IM and Sub-Q) into the neck, to avoid damaging the best cuts of meat. With the change in practices, cattle-handling equipment changed and evolved. It’s difficult to give neck injections in most of the older squeeze chutes without risk of breaking needles, syringes or even your hand when cattle ram back and forth in the headcatch. The newer squeeze chutes that hold the animal still and keep head and neck immobile were an improvement for proper placement of neck injections. “I really like my Silencer chute. Most of the new chutes are set up for easier handling of the cow as well as easier injections. You can get to the animal easily for injections, and it holds the head and neck stationary. With the neck-stretcher extender, anyone can hit that open space where the neck shot should go and not have to worry about getting smashed by a swinging head,” says Westphal. “My chute is hydraulic, and you don’t hear it rattling like the old ones did. There’s no noise and chaos at the chute, and the animals coming up the alleyway don’t become alarmed. Our animals go through the chute calmly and quietly,” says Westphal. 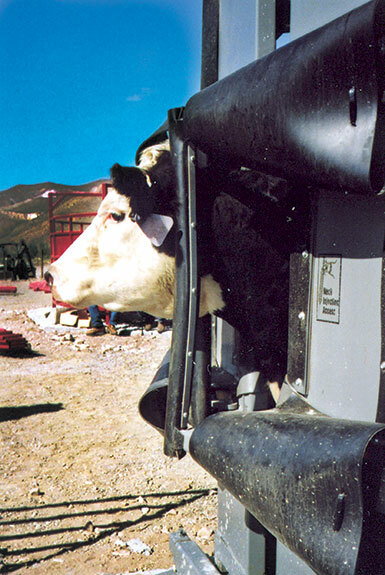 Advancements in chute design have aided low-stress cattle handling. “The new designs have also made cattle work more efficient – increasing the speed we can do everything while still handling cattle quietly and calmly. On our ranch we can preg-test 500 cows in a day and not stress them. When fertility testing bulls, we can do 100 and have time left over. It used to be a stretch to try to do 30 a day, and it was often a challenge to keep the bull on his feet. The new hydraulic chutes hold them up and keeps them still so they can’t dance around,” he says. “The combination of what we do with our purebred cattle and records, and BQA, makes it easier to keep track of everything, including vaccinations and health care. The old saying, ‘If you don’t know where you’ve been, you can’t know where you’re going’ is very true. It’s nice to be able to look back in the records and know which animals got which vaccinations or treatments and when,” he says. “Again, this is often tied into the handy aspects of the chute. We have a scale underneath; the animal’s weight flashes onto the screen when they walk in. We know how much medication to administer, based on the animal’s weight, whether it’s a pour-on or an injection. We are not overdosing and wasting the product, or underdosing with an inadequate amount. “We also know whether the animal has lost weight since the last time it was in the chute. With that same program – the weight going right into the computer – we can say what we are doing and why the animal was in the chute, and whether it was there for medical reasons or routine processing. Then we have all the records if we need to access them later,” he says. Being able to administer proper dosages according to weight is more effective for the animal and more cost-effective for the producer. Facilities also make all the difference in the safety of the cattle and the people handling them. “Ours are now all on concrete, so you are not walking ankle-deep in mud and manure during wet seasons. The mud always made it harder to get out of the way if an animal comes running by. We also have a tub to work the cattle through so you are not pushing them or trying to twist tails or getting your feet stepped on. There’s no reason to ever be up against one of them because the gate system is swinging behind them as they enter the tub and go right on through. With some hydraulic facilities a gate goes in behind the new batch and hydraulically moves them up,” he says. This makes it much easier to handle cattle efficiently, calmly and quietly. “In the old days we’d all get together and help each other out, but today every ranch has their own help and we don’t depend so much on neighbors; everyone is too busy. Today we find ways to do it efficiently with fewer people. I don’t want strangers coming in and messing things up or handling my cows.” When cattle are well-trained to be handled properly, you don’t want someone getting them excited. Low-stress cattle handling goes hand-in-hand with BQA. It’s all part of the whole process. If cattle are easy to handle, it’s also easier (and safer) to use proper techniques when administering vaccines and other drugs and products. TOP: Montana Charolais producer Buddy Westphal. Photo courtesy of Buddy Westphal. BOTTOM: The neck extension element on this chute allows safe and easy access for neck injections. Photo courtesy of Heather Thomas.